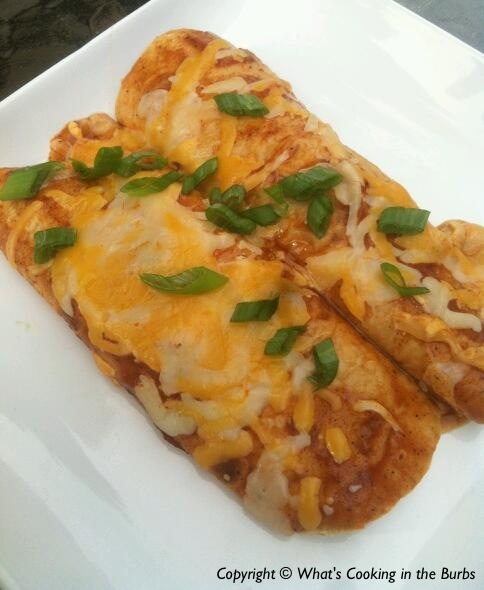 I love enchiladas. I actually consider them comfort food. I don't make them often anymore because they aren't the most diet friendly dish. I have however, been craving them like crazy lately so I had to give in to my craving! I mixed up one of my favorite enchilada recipes using leftover bbq pulled pork that we had last night and let me tell you....they were a hit! Mix pulled pork with BBQ Sauce, cayenne pepper, salt, and green chilies. Mix well. Add 1/2 cup of enchilada sauce to your baking dish. Spread it around so it coats the entire bottom of the dish. Assemble the enchiladas by spooning 1/4 cup of the pork mixture down the middle of your tortilla. Sprinkle 2 tablespoons of cheese on top of the pork. Wrap the tortilla around the filling tightly and place it seam-side-down in the pan. Repeat with remaining tortillas and filling until you have finished filling 8 tortillas. Place the tortillas side-by-side in the dish. Pour remaining enchilada sauce over the top of the stuffed enchiladas. Cover the dish with foil and bake for 20-25 minutes. Garnish with any other additional toppings of your choice. Enjoy! Yum! I'm totally craving pulled pork now! Thanks for linking to What'd You Do This Weekend? Hope to see you next week. Great recipe. I love shredded pork in Mexican dishes! However, I have never made it at home. We smoke pork loins and butts all of the time so this will be the perfect recipe for us. Thanks so much for sharing this on the BBQ Block Party! Aaah, I am loving the use of shredded pork AND bbq sauce in this recipe - sounds fabulous. This dish would certainly be a man-pleaser around my house, pinning this right now. :) Thanks for sharing at #GetHimFed Friday, hope you have a nice week! Not long ago, I googled recipes for BBQ pulled pork, because I had a lot left over from making sandwiches. This recipe was a huge hit with my husband, and I'm making it for the 3rd or 4th time tonight. Thanks for sharing! I'm so glad you and your husband enjoyed it!